Krish Malhotra meets Ananya Swaminathan at IIM Ahmedabad where they are both pursuing an M.B.A. Ananya’s charm and good looks bring her to the fore of the popularity chart at the Institute and although Krish finds her very appealing, this reputation makes him wary of her. Ananya enlists Krish’s help who is an IIT graduate and the duo began their friendship. Soon this friendship blossoms into love and the pair become inseparable. The real story begins in their last year at the Institute when having moved past all of the other person’s idiosyncrasies, the two are resolved to tie their love through the bond of marriage. However, they aren’t the only ones involved in this decision and although they are in love, there is the question of their families. With the parents not accepting their love, Ananya is sent off to meet Tamil Brahmin boys while Krish is sent off to meet respectable Punjabi girls. However, Krish cannot forget Ananya and is the same with her and he embarks on a quest to win over her family to finally marry her. Through a number of amusing and misfortunate clashes, the families disapprove of this union due to their cultural and ethnic differences. The magic that is Bhagat’s gift in storytelling is his use of humor and candor and he employs these devices to full use in this story where the North-South polarities provide generous comedic effect. 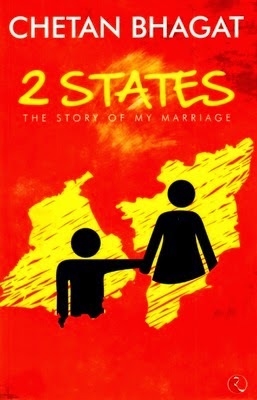 Narrated from Krish’s point of view, a first person narrative, 2 States: The Story Of My Marriage is an infectiously lighthearted read that digs at the ethnic gap between Indian communities. The rights of the book have been sold to producer Nadiadwala who is adapting the warm tale for the big screen. Chetan Bhagat is a bestselling author, speaker and columnist. His other books include What Young India Wants, Five Point Someone, One Night @ The Call Center, Revolution 2020 and The 3 Mistakes Of My Life. Bhagat studied Mechanical Engineering in IIT Delhi and went on to graduate from the Indian Institute of Management. He worked as an investment banker in Hong Kong for 11 years before returning to Mumbai. Here he pursued writing and quit his investment banking job after publishing his first three novels in 2009. Four of his books have gone on to become motion pictures and Time magazine has named him one of the 100 most influential people in the world in their poll. He contributes to a number of Hindi and English newspapers. He was awarded the Society Young Achiever’s Award in 2004. He is married to Anusha Suryanarayanan.